An air preheater (APH) is an equipment designed to heat air before another process with the primary objective of increasing the thermal efficiency of the process. The purpose of the air preheater is to recover the heat from the flue gas thereby increasing the thermal efficiency of the equipment by reducing the useful heat lost in the flue gas. 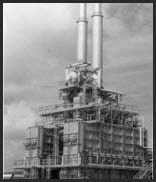 As a consequence, the flue gases are also sent to the flue gas stack at a lower temperature, allowing simplified design of the ducting and the flue gas stack. It also allows control over the temperature of gases leaving the stack (to meet emissions regulations, for example). Incinerators facilitate waste destruction in a furnace by controlled burning at high temperatures. Incineration removes water from hazardous sludge, reduces its mass and/or volume, and converts it to a non-burnable ash that can be safely disposed of on land, in some waters, or in underground pits. However, it is a highly contentious method because incomplete incineration can produce carbon monoxide gas, gaseous dioxins, and/or other harmful substances. The EDC cracking furnace is used to thermally crack ethylene dichloride (EDC) to produce vinyl chloride monomer, a raw material of PVC. 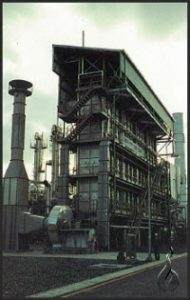 An EDC cracking furnace complete with air preheat system was revamped using Krebs process design to de-bottle neck the furnace and improve its efficiency. BORN has developed it’s own EDC Cracking Furnace model that has been updated by empirical operating data. BORN is well-experienced in identifying, procuring and supplying the most suitable ancillary units that add to the overall efficiency in operation. This platform heater was modularized and delivered to the site by barge. Note the four radiant cells are complete with ‘U’ tube assemblies, manifolds, burners and refractories. The convection section and stack were prefabricated for bolt-up assembly at the job site. The barge took the platform heater to the dock adjacent to the refinery where it was positioned on foundations with a single lift. Born manufactures Steam Reformers utilizing technology supplied by companies such as Haldor Topsoe, etc. They can be down fired or side fired depending on the client’s requirements and the technology to be used. The tubes are spun cast alloys. Refractory linings are suitable for high temperatures and include ceramic fibre modules. 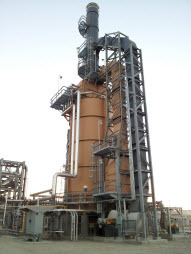 Our Thermal Oxidizers are custom designed to meet the highest thermal destruction efficiency requirements as well as NOx emissions and CO requirements. Fume wastes as well liquid wastes can be burned to completion and without soot production. 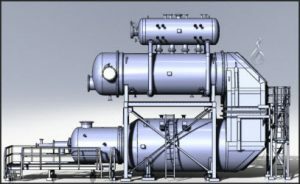 Thermal Oxidizers can be built with and without waste heat recovery systems. See Waste Heat Recovery Systems (WHRS) for more information. Damper controlled convection section flue gas bypass is an option with WHRS so that the temperature of the process fluid in the WHRS can be maintained independently of the incineration requirement. 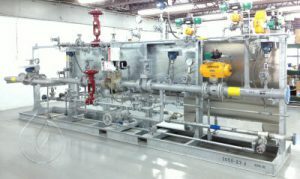 Born Environmental also supplies instruments with a burner management shutdown system for thermal oxidizers. The unit can even be instrumented to allow safe unattended startups and shutdowns. 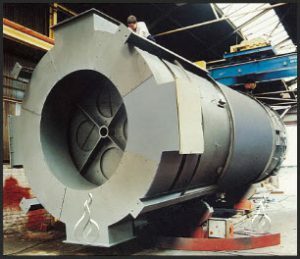 Superheaters convert saturated steam, which can more easily revert back to a liquid state, into superheated steam, which remains in a gaseous form. This has distinct advantages in certain types of energy production—for example, superheated steam is better suited for use as an energy source in a reciprocating engine than as a heat source. In your steam boiler system, there are different types of superheaters that you can use, and it’s based on where inside the system they are located. High energy venturi scrubbers are ideal contacting devices for removal of sticky contaminants and particulates from gases. They can be designed for removal of particulates, SOx, HCL, and organic acids. They have the advantage of no plugging tendency, and no packing, and can be designed to treat high temperature gases well above 1,200°F.